Ballymore will line up four runners in tomorrow’s midweek meeting at Te Aroha - with three horses to resume following spells and the other looking to go one better following an encouraging debut effort at Matamata last month. The regally bred son of Red Giant, Saint Finn, produced a gallant effort when running second on his home track and all indicators are pointing to another encouraging performance despite the wide barrier draw. “He’s taken a stack of improvement from his first outing and it’s really switched him on,” co-trainer Pam Gerard said. Saint Finn carries the colours of Westbury Stud’s principal, and prominent owner, Gerry Harvey, and will be ridden by international jockey Mark du Plessis. A horse we have been looking forward to seeing back at the track is the lightly tried, but hugely talented, Sororia who is gearing up for another successful winter campaign when she resumes in the Rating 75 event over 1400m. Well short of her ideal distance, the daughter of Iffraaj has come back bigger and stronger and has a fresh-up record, although she is another that will have to overcome a wide barrier draw. Despite several setbacks, The Heat Is On looks right on target to produce an encouraging run and is another who will take plenty of improvement for the outing. With Craig Grylls under saddle, The Heat Is Son initially showed very good promise early on, although has had to overcome a run of back luck. Another that has shown plenty of ability is the regally bred You Are Amazing who resumes in the Rating 65 event over 1200m and will be ridden Michael Coleman. 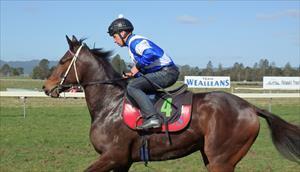 “She shows plenty of the track at home, but has a hard time relaying that on the track,” Gerard said.